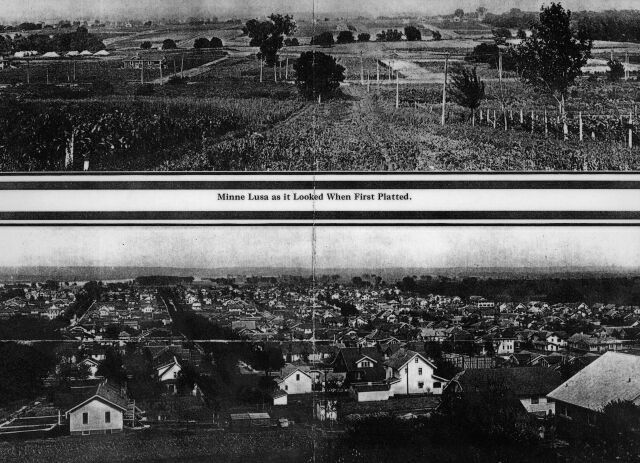 Minne Lusa when first platted (1916) and seven years later (1923). As I understand it, this is from the Martin Ave entrance. If I understand my notes correctly, the bottom view was taken from a balloon by someone named Bostwick, who took photos for Charles W. Martin. Both views are looking east towards the Missouri River,* and from nearly the same vantage point. It is not clear exactly which streets are visible. The community is now part of Florence. It has been where some of Florence and Omaha's finest have built homes. Minne Lusa sits to the east of downtown Florence, extending North and South, and centered on the beautiful Minne Lusa Boulevard. Take a drive and you will see that this is a proud community.